You know as a blogger, if you want to maximize the visibility of your blog and brand, you need to get your blog post out there for people to read. But, whether you’re blogging as a side hustle or this is your full-time gig, churning out original content on a consistent basis is a challenge. There’s just no time to produce epic-propportion-type posts that will grab your audience and make them read, share, and sign up to your email list. Those types of posts can take hours upon hours to research, write, re-write, edit, and edit some more. You also have to create graphics, and then spend most of your time promoting the post on social media once it’s published. If you have the budget, you can hire freelance writers to help fill up your content schedule. But, if you’re bootstrapping your business, it’s going to get harder and harder to maintain your content schedule. 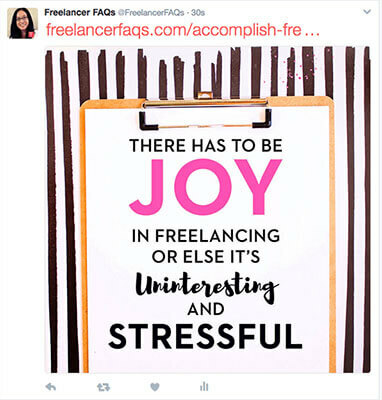 And if your blog is helping you make some income, then burning out isn’t an option. So, what do you do when you have no time to create content, but still want to grow your blog and brand? The answer is repurposing your content. Repurposing your content opens the doors to reaching more people and breathes life back into old posts that you know are well written and highly informative. When you repurpose your content, you reuse and reformat your old posts making them suitable for other content outlets. But, if you’re a new blogger, you probably haven’t embraced – or even know about – newer ways to repurpose content. Let’s look at 24 ways to use the content you already have and change it around to reach more people. Infographics are a visual representation of your blog post. They are a great way to boost your social shares since visuals are shared more than written posts. 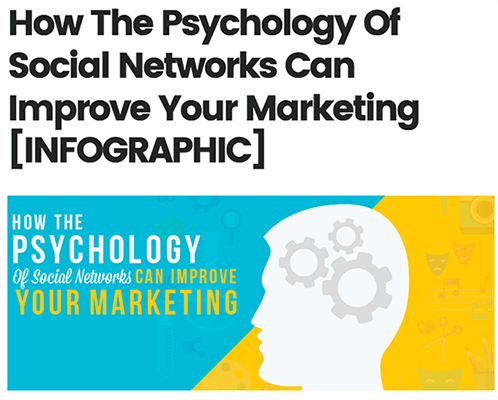 For example, Adam created an infographic from this post and published it as a new post on Blogging Wizard. He uses infographics not only on his blog but on other blogs too. For example, to take an infographic to the next level, Adam took a group interview he published on Blogging Wizard and approached TweakYourBiz about repurposing this into an infographic for them. When the infographic was published, it exceeded his expectations. It received an extra thousand shares and over 35,000 views to date. To get started, you can use Piktochart or Venngage to create free and professional-looking infographics for your blog post. When drafting up your infographic, treat it like a blog post. Make sure it has a gripping headline, clear topics with supporting facts or examples, and a conclusion. If you don’t have a tool to help you create and edit images yet, check out this post (a bunch of them are free). LinkedIn’s SlideShare is a fabulous way to turn a blog post, email course or any other type of content into an engaging and visual representation. 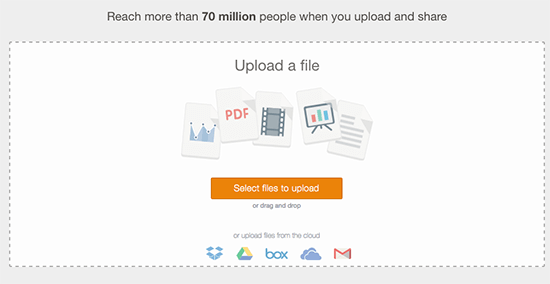 First, upload your PDF slides or your PowerPoint, Keynote, or OpenDocument presentations. SlideShare then turns them into a slide deck presentation. Viewers can click through your SlideShare and learn about your content. Repurposing old content this way can increase your traffic and shares. For example, Adam repurposed his content from a blog post to a SlideShare presentation and generated 1,000 more social shares. When choosing what type of blog post or other piece of content to use to create your SlideShare, make sure it presents a problem, and then the solution. The best SlideShares focus on a problem that your audience is struggling with. Another thing to remember when creating your SlideShare is to present your information in bite-sized chunks. Imagery is often used in these presentations as a way to enhance your content, making bite-sized information easy to relate. When done, SlideShares can be embedded in your blog post and uploaded to your LinkedIn profile. And if you’re on the fence about using them – this post by Venngage shows exactly why you should. Quora is a large Q&A site. You can ask questions on any topic and wait for answers, or you can answer questions related to your niche. But, how can Quora help you repurpose your content and get your blog out there? There are two ways to go about this. On Quora, you can create a blog and post anything you want. But, if you want to market your blog, you can repurpose your blog posts on Quora like James Clear does. Just make sure to write a disclosure that this post was originally posted somewhere else. Another way to repurpose content is to take the answers you provide to Quora readers and turn them into a new blog post. 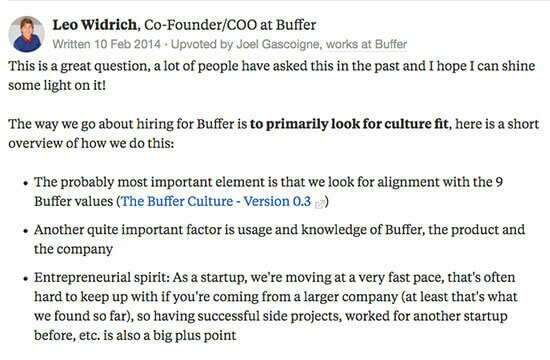 This is something that Buffer did when someone on Quora asked how to get an interview at Buffer. The COO at Buffer answered this question. This invariably led to a blog post on Buffer’s blog. Quora strips referral data so your analytics won’t know if it’s sending traffic. You’ll need to append your links with UTM tracking codes. Buffer has a great post on the topic that explains more. Facebook is a great way to get more engagement for your blog. For me, while Pinterest helps me grow my traffic, Facebook gets me more comments on my blog – hands down. You can capitalize on this engagement by repurposing your blog post into a Facebook post for a Facebook group or your Facebook page to incite discussion. For example, Fabi Paolini often uses content – with eye-catching graphics – from her blog posts in Facebook groups. The thing to remember when repurposing your blog post as a Facebook post is to always share valuable content. A lot of Facebook groups don’t allow promotional posts, which means no links back to your site. You can get around this by doing what Fabi does – posting a valuable and personal post that motivates readers. Readers can click on her name, and if her Facebook page is linked to her personal profile, click to see who she is and what she’s all about. If you’re stuck on what to email your list, you’re not alone. A lot of bloggers have no idea what to email their list, other than notifying subscribers about their latest blog post. But, if you want to capture your list and get to know them better, you can provide exclusive tips and strategies just for them. Doing this week in and week out, however, can be tough. There’re only so many awesome tips you have, right? One quick and easy way to get more exclusive tips is to repurpose questions in your Facebook group – or any Facebook group. 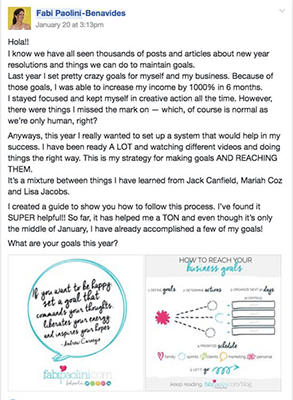 Jen Snyder of Woman Winning Online always answers questions from her followers in her newsletter emails. You can also use comments from your blog to expand on your answer for a newsletter. Other ways to use repurposed content for emails is to use an old blog post and pick out the best tips. You can update it to reflect how it’s relevant during this time in your weekly email. 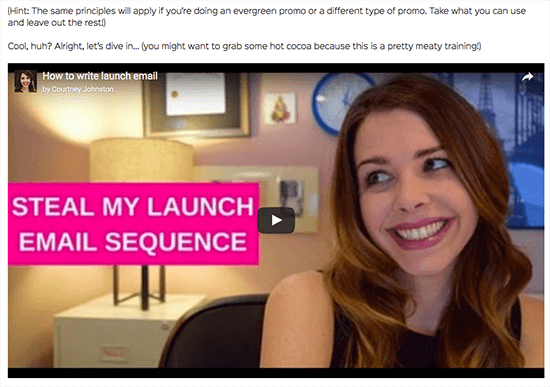 If you want to create an email series, you can use old blog post content to welcome your new subscribers. Free courses are usually used as a lead magnet to grow your email list, and it’s the perfect way to start a sales funnel if you have a paid course or service you want to offer. There’s no rule that says you can’t use old content and repurpose it into a free course. Go ahead and take old blog posts and even other lead magnets and turn them into a jam-packed, high-value free email course. 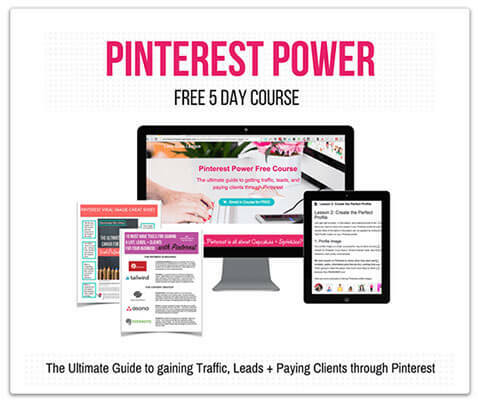 Summer Tannhauser of Lady Boss League repurposed some of her blog posts on Pinterest to add to her free course – Pinterest Power. Just don’t forget to create a strategy to fill your sales funnel – creating it is only part of the puzzle. Challenges are also another great lead magnet idea to grow your email list. Challenges allow you to be in your subscriber’s inbox every day, or at least more often than your regular schedule for your newsletter. This fosters a relationship and helps let your subscribers know you on a different level. In a challenge, you create a game plan for your subscribers to follow. It can be anything from growing your email list in 30 days to tips and tricks to potty train your child in a week, and anything in between. Terra Dawn of Uncork Your Dork runs regular challenges that are full of valuable strategies. Sometimes her content is repurposed into a challenge, and sometimes her challenge content is repurposed into a blog post. In either scenario, you can use old content to help create your challenges, and vice versa. Periscope is a live streaming platform, and if you have an active Twitter following, this platform can help to grow your brand and blog. You can use Periscope to repurpose old blog posts, emails, courses and more. By far, the best way to repurpose content is to change mediums – a post to a video or video to a podcast. Jonathan Milligan of Blogging Your Passion has a Periscope repurposed from a blog post of the same name. People like to learn in different ways – written, audio, or visual. Jonathan makes sure to capture a bigger audience by providing multiple ways to consume his content. Growing your email list can be a challenge. It can depend on your promotional strategy, your audience, or your opt-in freebie to see how successful your strategy is. When creating an opt-in freebie, you don’t have to look far. Your blog posts are there to help your audience’s problems, so why not use that content to craft a lead magnet? As a mom and freelancer, I don’t have a lot of time to create content. I have many clients and multiple blogs to juggle, and I’m a bit time-starved. So, one thing I did was repurpose a blog series I had on my blog – 12 Days of Holiday Freebies – and turned that into my lead magnet – 190+ Free resources to grow your blog. Doing this helped me save a lot of time because the research was already done when I created my series. I shared a lot of free resources from Tailwind Tribes to courses to traffic tools and more. Instead of these free tools staying on my blog as posts, I created a new lead magnet listing these free resources, and it’s one of my best-performing lead magnets that helps me grow my email list. Bundle a blog series or expand on a blog post and create a lead magnet that solves your audience’s problems or helps them overcome a challenge. Need some extra help with your lead magnets? 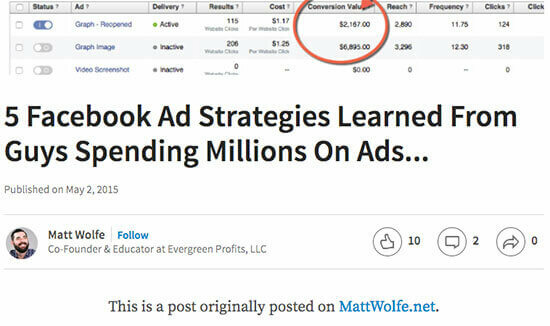 Check out Adam’s guide to creating and delivering lead magnets that convert. Podcasts are becoming more popular among bloggers across every niche. When creating episodes for your podcast, a great way to structure them is to build a theme around your blog and podcast. This can help form episode ideas, and it can lend itself to repurposing your content either way. For example, Copyblogger has their podcast Rainmaker.FM, and they regularly repurpose content from their blog and site to turn into their episodes. Creating an ebook is a fantastic way to monetize your site and to also get more email subscribers. But, for a lot of bloggers, creating an ebook takes time out of their day. If they work full-time and have a family to take care of, their blog is often the last thing on their plate – not to mention that their idea is shelved as low priority. So, instead of trying to come up with unique and new material for your book, why not use inspiration from your blog? Find some popular blog posts and repurpose them into an ebook. 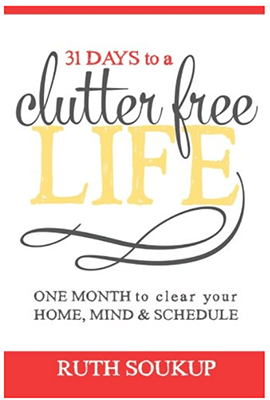 For example, Ruth Soukup of Living Well Spending Less repurposed her October blog posts into an ebook, 31 Days To A Clutter Free Life. Whether you choose to sell your ebook or offer it for free, setting up a landing page will dramatically improve your conversions. Another big search engine is YouTube, and a lot of bloggers are using this video platform to reach a new audience. Video also helps your brand become more authentic and more personal with your followers. They see and hear you and make a new connection to you. This can strengthen your brand and help you make more sales. Courtney Johnston of the Rule Breaker’s Club creates a video version of most of her posts, which is embedded right on her blog. It’s also linked from her YouTube channel. Another way you can use video to repurpose your content is with a video series. You can repurpose old blog posts, emails, Facebook posts or any other type of content and turn them into a video series for a lead magnet. Lizzie Davey of Wanderful World has a 3-day video series to help boost your freelance career. Or, you can use one or more tips and turn them into a video series for your YouTube channel like Rebekah Radice. A tweet is only 140 characters, so how you can repurpose a blog post as a tweet? Why not use snippets of phrases from your blog post to make a series of Tweets? For example, CoSchedule tweets about using subheadings for SEO, which links back to this post about an SEO checklist. While people can tweet that caption, you can also make a graphic and share that on Twitter as a way to get noticed on people’s feed. Your tweets don’t always have to be about your latest blog post though; use Twitter as a way to provide valuable tips to your target audience. For creative entrepreneurs and bloggers, Instagram is your playground, amiright?? Filled with lovely images, inspiring Instagram Stories and Lives, it can boost your brand and help you grow your audience. But what do you post on Instagram for business? There are no live links and hashtags are the “thing” on this platform, so, as an entrepreneur, what do you do? You can repurpose your blog posts as an Instagram post. Make sure to be a bit more authentic and personal in your post, provide a link, and use appropriate hashtags. Think Creative Collective often use parts of their post as their Instagram captions, like they did for this post. If you want to develop a course for your audience, you don’t have to start from scratch. 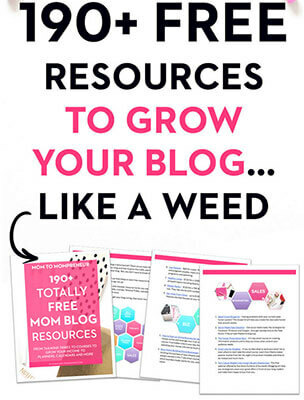 Suzi of Start a Mom Blog talks about beginner blog topics for new mom bloggers on her site. She also has a course called Blog By Number. Some of her course material is repurposed from blog posts – obviously going a lot deeper on the topic in her course. For a lot of readers, they would rather buy a course that has all the important tips and strategies packaged, rather than hunt around your blog and read every post you have. Webinars are another great way to grow your email list and get more personal with your target audience. They not only help show your experience in your niche, but it can show your personality, odd quirks, and all-around peppiness. Coming up with topics can be a challenge, but you don’t have to look far to find that perfect topic. Use your blog posts as a way to find that magic webinar topic. 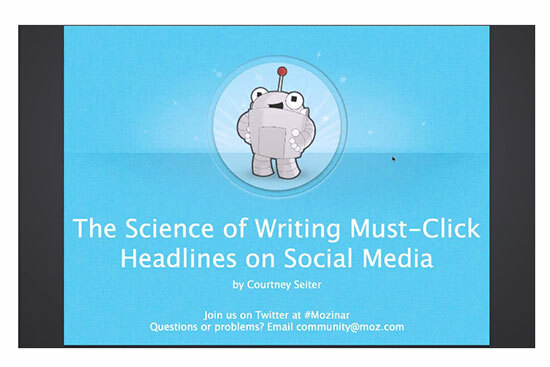 For example, this webinar that Buffer did with Moz uses a lot of information from Buffer’s posts about headlines. Webinars can be a great way to grow your email list. This post will show you how to get started. The main goal of repurposing content is to get your blog posts in front of more people. Syndicating content is usually the main way a lot of bloggers and businesses repurpose their content. A popular site to syndicate your content on is Business2Community, but some large sites like Huffington Post also allow its writers to syndicate content on their platform. You can also pay to have your content included in a content discovery network like Taboola or Outbrain. Your content – in this case your post’s title, image and a link – can then show up in a “recommended reading” section on hugely popular sites like CNN, Time and the Washington Post, usually below the main content or in the site’s sidebar. 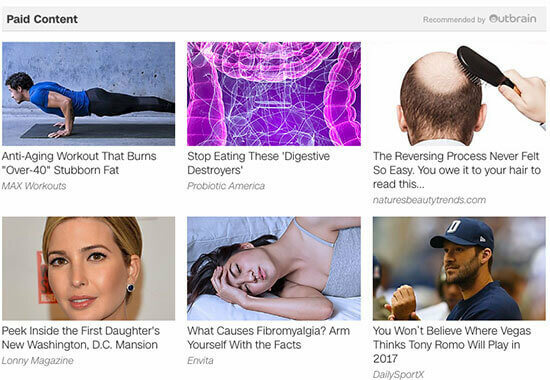 Many of these paid advertisements are “ViralNova” type sites that shock and delight readers. If you’re hoping to get search traffic to your content – and you’re syndicating full articles – it might be a good idea to only syndicate content that you aren’t trying to rank in search engines (or older posts that don’t generate search engine traffic), just to be on the safe side. At the very least, wait a month (maybe longer) before syndicating any new content just to give your site a better chance of ranking for the content first. A similar approach to syndication is to republish your content. This is another way to get more eyeballs on your content. There are many ways to republish your content. You can repost it to Quora like James Clear, or use LinkedIn Pulse like Matt Wolfe, Medium like Derek Halpern, or Flipboard like Michael Reynolds of SpinWeb Innovations. What’s great about these platforms is that they have a large built-in audience to leverage for traffic, and they also offer an excellent opportunity to include call-to-actions to landing pages for email list growth. As with syndication, use older posts or ones that don’t have high search traffic to republish on Medium or LinkedIn and Quora. People consume content in different ways. One thing that’s becoming popular is to repurpose your content as an audio version. If you’re not keen on making a podcast, you can make an audio version of your blog posts. This reaches people who would rather consume content on the way to work or people who enjoy listening rather than reading. Melyssa Griffin sometimes makes an audio version of her blog posts. Guest posting is another way a blogger can use to get noticed and get more people to read your content. It’s said that guest posts should be your best content since it’s going to reach a new audience and has the potential for conversions. However, there’s no law that says you can’t repurpose content you already have on your blog or other places for a guest post. Use your old content as a way to inspire you and help you get more ideas for your guest post. If you are an email marketing specialist, most of your content will center around email marketing. Suffice it to say that each of your posts – and guest posts – will have common elements such as email service providers, using social media to grow your list, creating a welcome series and more. How you approach guest blogging will impact how much traffic (and subscribers) you get from it. Read Adam’s post on guest blogging strategy to squeeze the most you can out of each guest post. Readers enjoy new content that’s relevant. If you have older blog posts with outdated information, screenshots or even wrong information, you can update them and breathe new life to them. This serves as a way to refresh old blog posts and repurpose them into better content for your audience. For example, on WP Superstars, there was a post about FAQ plugins from a year ago. This post served as a relevant post when it was published, but later in the year, new plugins were created. Adam decided to update this post with more FAQ plugins, making it pertinent to today. Live streaming is a hot trend lately, and it’s something that can build your brand quickly and reach a lot of people. You can use Facebook Live on your Facebook page or in a Facebook group. Go ahead and repurpose your blog post or even a lead magnet. 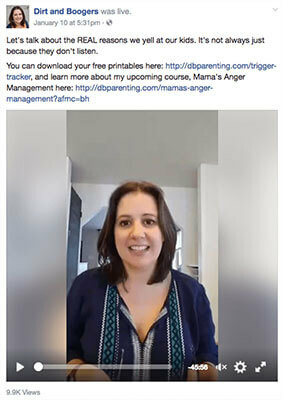 Amanda from Dirt & Boogers did a Facebook Live on her Facebook page about the real reasons we yell at our kids and strategies to calm down as parents. Some of the tips she mentioned are also found in one of her lead magnets – 50 Calm Down Tips. As a blogger, you have to come up with new blog topics every month, right? If you’ve been doing this for years, it can still be a struggle to find new and unique topics to write about. Instead of trying to come up with new and innovative blog post ideas, why not look to what you already have? Go through your old blog posts and see where you can repurpose content. For example, you might extract a subheading from a post and make a brand new blog post out of it. Or, you can turn a blog series into one epic post, and vice versa. Take one idea or one blog post and split that into a blog series. One way to reach a new audience is to turn an old blog post into a roundup. If you have a popular post on your site, why not ask key influencers in your niche to contribute to your post? Take an idea from one of your popular posts and repurpose that into a question you can ask bloggers for your roundup. Another way to repurpose content is to create a list post based on old blog posts. This is a great way to link to supporting content when you create your list post. Finally, you can expand on a blog post comment. Take some time to look over your blog comments; there’s a blog post waiting to happen in one of your comments. Growing your blog traffic takes a lot of time. With the content creation and editorial process, promotion strategy, creation of any imagery, and general blogger outreach and networking, your days are probably fully booked. But, for many of us, blogging isn’t our full-time gig. We have work, family and other obligations that often makes finding time to blog, difficult. One way to shave off time is to repurpose your blog posts. This is a huge time saver and a great blogging practice to use. If you have popular blog posts, repurpose them into lead magnets, webinars, Facebook Lives or even an ebook. If you want to create a course, write a guest post or make a new podcast episode, use old blog posts for inspiration and information. Finally, if you want to promote your blog, you can repurpose your content into social media posts, YouTube videos – or you can always syndicate and republish your content.